Suite 107 is a ground floor, completely remodeled suite with breathtaking views of Lake Charlevoix. 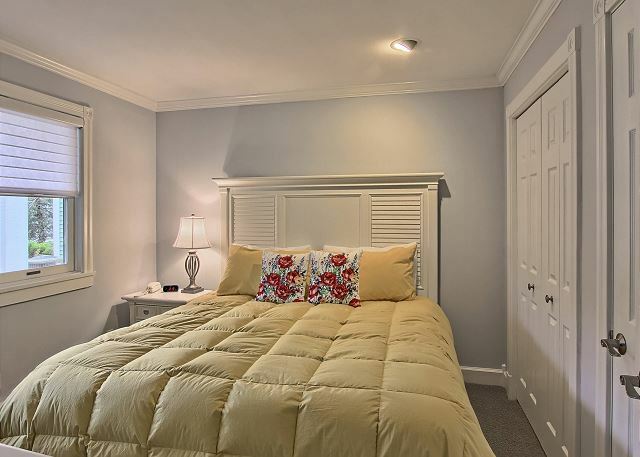 This unit offers one bedroom with a king size bed and one bathroom. Suite 107 has a fully equipped kitchen with gorgeous granite countertops all ready for preparing meals. 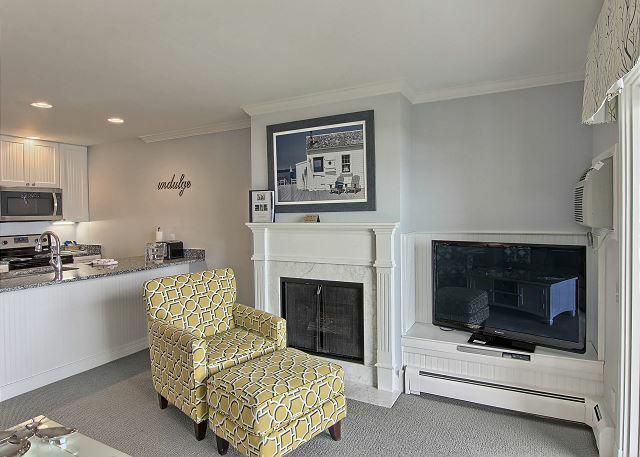 The living room has a queen size sofa sleeper, gas-log fireplace, and a flat screen TV. The sliding glass door opens to a patio that has direct access to our private beach, and downtown is just a few steps away. We've had good experiences here and have stayed quite a few times. Only issue this time was that someone had smoked in the room before we arrived. Never had this issue before. 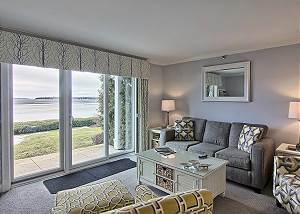 I was extremely pleased with my room and have recommended Water Street Inn to several friends. A great getaway. 2 night/day trip to Boyne Mountain for a family of three (3). Loved the area, the condo and the city of boyne. Our condo was spotless, well equiped and extremely comfortable for sleeping in. We were walking distance to everything in the City of Boyne for breakfast, lunch and dinner or cocktails. We would definitely stay here again. We had a great time. Every detail met our expectations. Even used the box fan we found in the closet. My wife needs fan noise to sleep. No complaints. Very quiet and relaxing. Nice, clean and very modern for our taste. The carpet may need a deep cleaning but other then that it was very clean.. It was our second time staying and will return to the same unit. Beautiful property, well maintained & immaculate. Nice view of the small beach area & Lake Michigan. We would stay here again a little longer as they also have a small marinas & boating rentals. Great vacation retreat. My husband and I had a very enjoyable three-night stay int this condo. 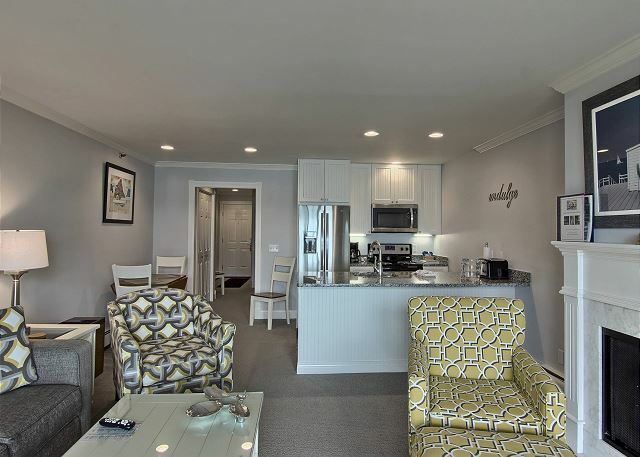 It has a beautiful view of the lake and is within easy walking distance of the marina, shops, restaurants and farmer's market. The bed was very comfortable, the rooms were clean, the communications before our stay were excellent. We would stay here again. I marked the condition down to a "4" because one of the living room chairs has a slope that makes it uncomfortable to sit in. 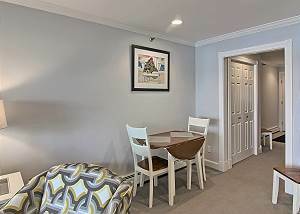 The photos are representative of the property. Beautiful view of the water. Condo was updated and super clean - very comfortable. Perfect proximity to town - walk to everything. This was an end unit. Landscaping on each side of the patio provided privacy from neighbors. Will definitely stay here again! Enjoyed our stay and unit was on the corner which made it private and quiet. 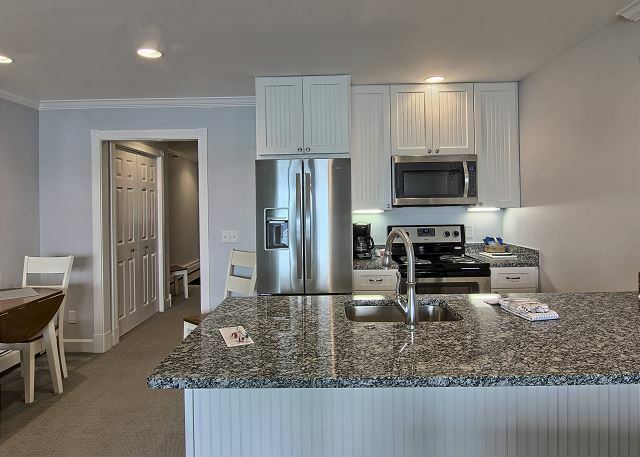 The kitchen was remodeled with nice appliances. Love the beach area and swimming is wonderful. Beautiful view of lake Charlevoix. Very comfortable accommodations ,we had a great stay. Outstanding unit! Great location on the beach with sunset view, walkable Boyne City, near Young State park, Charlevoix, etc. Great- staff is amazing here and never disappoint! The condo was great! 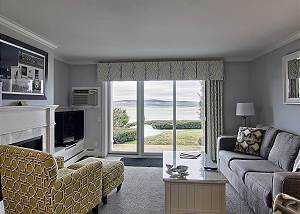 A beautiful view of Lake Charlevoix. It was clean with modern decor throughout. The kitchen was organized and well stocked. 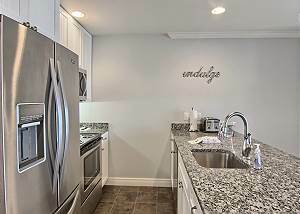 Including new stainless steel appliances. When we didn't feel like cooking we had plenty of restaurants to choose from within 1 mile of the condo. The only thing I wasn't satisfied with is that no key was left for me and no one was there. We called the manager on call but it was a little difficult to get in. I brought my 86 year old mother with me to stay for a weekend to attend the wedding of her granddaughter. She was in awe of the place and said she did not know such beautiful places existed. She loved the view of the lake, the fireplace, and the king sized bed (I slept on the couch... not so comfortable). All in all, though, we had a wonderful stay and I would definitely stay there again if in the area for an overnight stay. Everything went smooth. My company's headquarters is close by. They always book hotels that are more expensive and not nearly as nice. I told them about Waters Inn and they will be looking into it in the future. Have stayed in a variety of different units at this condo complex! Always pleased! We prefer the more updated units. The management staff and housekeeping staff are all friendly and helpful!Location is great to park your car and not drive for the rest of the day. 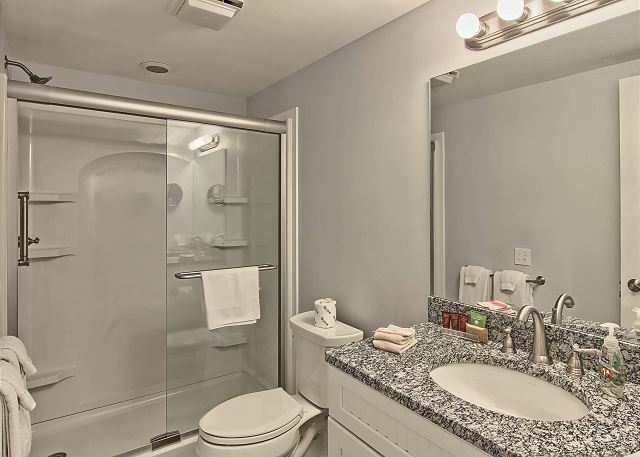 This condo was clean, updated, and PERFECT during the fall season. The view/colors were amazing on this spectacular lake! 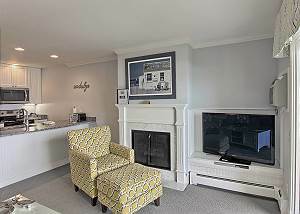 The location was prime and within walking distance of Downtown Boyne. We really enjoyed staying at Water Street Inn. Two thumbs up! 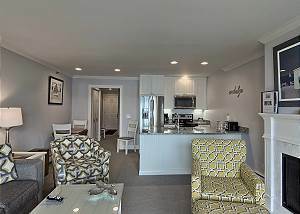 beautiful view, renovated condo, comfy and cozy. What a wonderful place to vacation...we will definitely be back...hopefully for a whole week next time. Extremely clean place, everything you need in kitchen. Will say though that the couch was a bit uncomfortable for TV viewing...maybe time to replace. Loved the view of the water! Great town just steps away. Great time and hated to leave. Condo was beautiful with great views of lake charlevoix. Private beach and within walking distance to the shops. This was the perfect vacation! I wish we could stay longer. 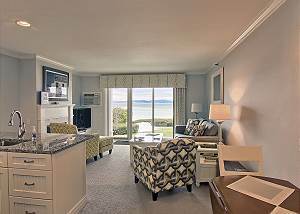 The units are right on the private beach separated by a beautiful green lawn with rose bushes. Yet, this is right at the center of a little cute town with several elegant restaurants, ice cream shops and bars. Once you enter unit you are away from everything looking at the sunset over the lake. Our unit was sparkling clean loaded with everything we needed. The management and staff are very friendly and helping with any need. Generally, all people I met in Boyne City were very friendly and social. We give this resort a 10 out of 10! Fabulous is the one word!! We loved staying at One Water Street!! It was clean and beautiful. Nicole was exceptionally friendly and helpful! We would love to stay here again!! We loved this cozy unit (#107). Great location , great view right on the lake, super clean. Well decorated. Top notch. Would stay here again. You need to bring your own tea or coffee cream though but otherwise great. We had a blissful experience. We were on the ground floor, just like the picture to my right. Quiet, tranquil, water birds, and bunnies abound. Wine and cheese from the Lake St. Mkt. Bliss. As always, a great place to stay. Beautiful and well maintained property. The cleaning staff do an excellent job. Nicole at front desk is wonderful and went out of her way to make our stay enjoyable. Only complaint I would have is the sofa is beginning to break down. Probably would not have noticed, but due to a few days of rain we spent more time inside than usual. 4 days to visit family in area. Would love to come back during the summer! Quiet Geyaway for Tired Moms!!! condo was 5 star - very clean - it had snowed and no effort was made to plow the parking lot or salt the walkway.